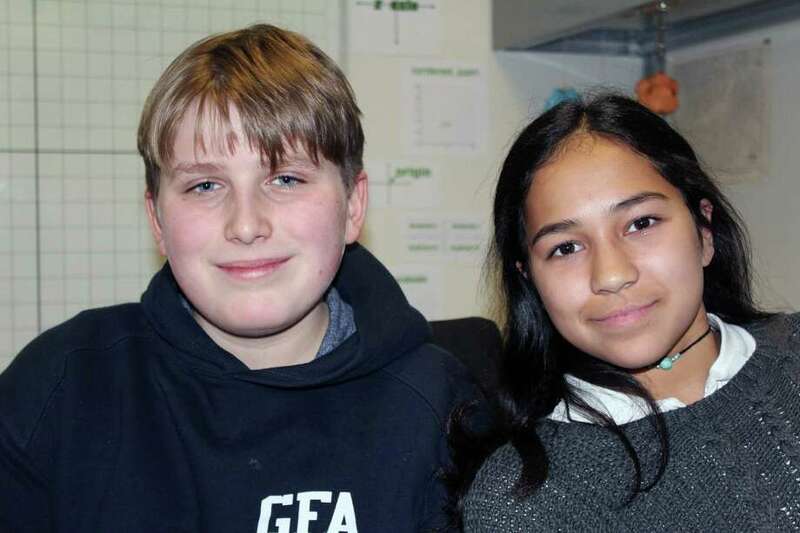 Greens Farms Academy Middle School Quiz Team members Karsten Rynearson, of Rowayton, and Kavya Krishnamurthy, of Westport, on Jan. 25, 2018 in Westport, Conn.
WESTPORT — This spring, a group of Greens Farms Academy middle schoolers are trying to go where no Greens Farms’ middle schoolers have gone before. A group of four eighth graders — Jake Farber, Kavya Krishnamurthy, Sam Lublinsky and Karsten Rynearson — recently climbed to the top of regional quiz bowl competition and have qualified for nationals this May in Chicago. “We’ve never had the caliber like we do now to go to nationals,” said Jon Matte, an upper school math teacher and coach of both Greens Farms’ upper school and middle school teams since they were formed in 2007. The group qualified in January by winning a regional competition at Middlesex Middle School in Darien, whose team won nationals two years ago. Greens Farms has long had a competitive upper school team under Matte’s direction, but until one player, in particular, with above average enthusiasm and skill for quiz bowl, which meets weekly as a club, the middle school had not seriously competed. That player is Rynearson, a tall eighth grader from Rowayton with a mop-top haircut and laser quick recall. He was the top scorer at regionals in Darien, and he’s leading and unprecedentedly successful season at Greens Farms. Rynearson is a serious quiz bowl competitor. Aside from the weekly meetings with his team at Greens Farms, he said he practices three or four hours a week on buzzers he keeps at home. “I just love the adrenaline of being at the buzzer of waiting to hear what the answer is going to be,” said Rynearson. He also spends his time reading potential questions which, he is adamant, are vastly different than trivia. “There’s a wide misconception that quiz bowl is trivia. Quiz bowl is a lot more than trivia. It’s quick recall, and it’s really facts that are important that you might not normally learn in school,” said Rynearson. There are three types of bowls: academic, history and quiz bowl. Teams of four compete together on various challenges, including “lightning rounds” and “toss-ups,” which test speed as much as knowledge. Players can buzz in at any time as the question is being read. “If you answer the question before a certain word, you get 15 points, if you answer after you get 10,” explained his teammate, Krishnamurthy. Though Rynearson is the team’s leader, it is important to have a balanced group. Rynearson, for example, considers himself a generalist but is particularly good in history, English and Spanish. Krishnamurthy, on the other hand, specializes in science and math and is experimenting in a different club to develop bacteriophage viruses — a virus that parasitizes a bacterium by infecting it and reproducing inside it — that may be more effective than antibiotics in fighting E. coli. According to Rynearson, the team is collectively strong and curious to test their skills on a national scale. The 2018 Middle School National Championship Tournament will be held from May 11 through May 13 in Chicago.